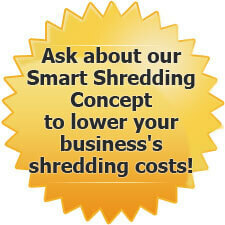 We offer a free analysis of your business to determine your specific shredding needs and the best solution for you. We also provide free locked and slotted security containers, which range from small office consoles to our 167-gallon bin, for secure on-site document collection. With our shredding services, you'll never need to spend valuable time removing paper clips, staples, binders or fasteners from your documents or sorting paper. Our most cost effective document destruction solution is off-site shredding. We can also perform bulk pick-up of boxed material at your facility or an off-site storage location. For off-site shredding, we come to your business, collecting the locked security containers containing your documents and securely transporting them off-site to our shredding facility. The documents remain locked in the containers until they are emptied into our shredder by a mechanical arm within 24 hours of arrival. Our bonded and extensively screened employees never handle your confidential material. In addition, our facility is under 24-hour surveillance with motion activated video recording. Off-site shredding can be performed on a regularly scheduled basis or as a one-time or occasional purge. After the documents are destroyed we provide you with an official certificate of destruction. Clients are also welcome to witness the destruction of their materials in person. All shredded documents will be bailed and shipped to paper mills for recycling into new products.